When it comes to rats, prevention really is better than cure. The most successful and permanent form of rodent control is to "build them out" by eliminating all openings through which they can enter a structure. Seal any openings larger than 1/4 inch to exclude rats and mice. Steel wool mixed with caulking compound makes a good plug. Seal cracks and openings in building foundations and openings for water pipes, vents and utilities with metal or concrete. Doors, windows and screens should fit tightly. It may be necessary to cover the edges with metal to prevent gnawing. Plastic sheeting or screen, wood, rubber or other gnawable materials are unsuitable for plugging holes used by the pests. There are many things that you can do to reduce the risk of infestation. Walk all round the outside of your home checking for any possible points where rats could gain access. Don’t confine your inspection to ground level, because rats will use to full advantage trees, ivy and other plants that are near or directly against a building and possibly gain entry to your attic. For EMERGENCY HELP, call Custom Pest Solutions! Keep your home clean. Maintain a regular check under your stove, refrigerator and check floors in the dining room and kitchen for any food spills since it could attract mice or rats. All places where food is stored, processed or used should be made rodent-proof. Food should be stored stored in glass jars, metal canisters or other resealable airtight containers. 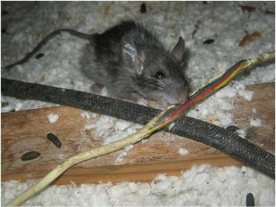 Look for rodent droppings, torn paper or fluff in corners of drawers or beneath stored mattresses or boxes. Rodent droppings look like tiny raisins or extra large apple seeds. They can be brown or black and often have a sweet sickening scent from being mixed with rodent urine. Rodent droppings are unsightly, smelly and cause diseases.